« Live Q&A with Johan Bruyneel 5:30pm (ET) Today! Years and years ago (2008), I had a terrible idea: I bet a bunch of Fat Cyclist readers that I could ride my rollers for 100 miles. A lot of you took me up on that bet, and I raised around $1,000 for LiveStrong — and had a story to tell. A year later, I did it again. But this time a bunch of you joined in, each of you donating generously for the privilege of riding your bikes for 100 miles either indoors at your home or on a ridiculously short course near your house. Then you sent in your stories. And amazing videos. And then, last year, the event got huge. 500 of you signed up, and we made a ton of money for LiveStrong to use in supporting people in the fight against cancer. Many sponsors sent in awesome stuff, making the 100 Miles of Nowhere event one of the swaggiest events ever. And for a couple of days, I got to post the incredible stories you sent in. Well, it’s high time you get some details. What Is The 100 Miles of Nowhere, And Why Should You Do It? The idea of the 100 Miles of Nowhere is to ride an infuriatingly small course for 100 miles (or 50, or 25, but ideally 100), to fight cancer and to show you have no sense at all. The profits from your race registration go to LiveStrong, to help them as they help people, worldwide, in their battle against cancer. You’ll have fun. You’ll be miserable. And, thanks to the fact that there won’t be hundreds of people all over the place, you almost certainly won’t have to wait for fifteen minutes to use an overflowing portapotty. And you get some pretty decent bragging rights. Namely, if you take some good pictures of you (and your friends) doing the 100 Miles of Nowhere and send me a good writeup, I’ll post it on the blog. Also, you get to claim that you won your division . . . since you get to create your own division. For example, I am the three-year consecutive reigning champion of the “Alpine Men’s 40-45 on Rollers” division. Which is a pretty big deal, if you ask me. Most importantly, though, is the fact that you’re joining Team Fatty in our ongoing fight against cancer. And that matters. Event Registration: April 11 – 18. Be certain that you register ASAP. Like last year, I expect this year to sell out again this year. Registration will be $85 this year. Race Day: June 4. But many people have emailed me saying that date doesn’t work for them, and they’d like to do it a day or two (or week or two) earlier or later. That is perfectly fine. But if you can do the 100 Miles of Nowhere on June 4, please do. For solidarity. Stories: Please send your race stories as soon after the race as possible. Like, the same day if you can. Any stories received after June 6 probably won’t make it into the blog (unless they’re so awesome I simply cannot resist). Here’s a true fact: If I were to call you on the phone right now and ask you to give me something, you’d almost certainly give it to me. That’s one of my superpowers: asking for stuff. Luckily for you, I use this power for good, not evil. At least 80% of the time, anyway. A Race Plate: My favorite souvenir of races is the race plate I get to put on my bike. The Runner and I like to staple them to the wall in the garage. So this year I’ve asked Bike Monkey — the folks who promote and run the amazing Levi’s GranFondo — to design a race plate you can attach to your bike. You know, so the fans will be able to recognize you. PRO Bars : I am totally addicted to PRO Bars — it’s just amazing how much better than normal energy bars they taste. Nuts, fruit, berries — they’re just good (and they’re vegan, which I believe will make at least some of you happy). 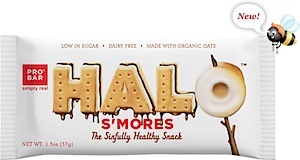 And now PRO Bar is introducing Halo bars, “The Sinfully Healthy Snack,” which you’ll be getting in your swag box. These are so new that I haven’t even tried one yet. But I have a suspicion I’m going to like them. An Issue (and special subscription rate) of Bike Monkey Magazine: Tired of biking magazines that teach you the same 15 tips and tricks, over and over and over, year after year? Or that review stuff you’ll never even consider buying? 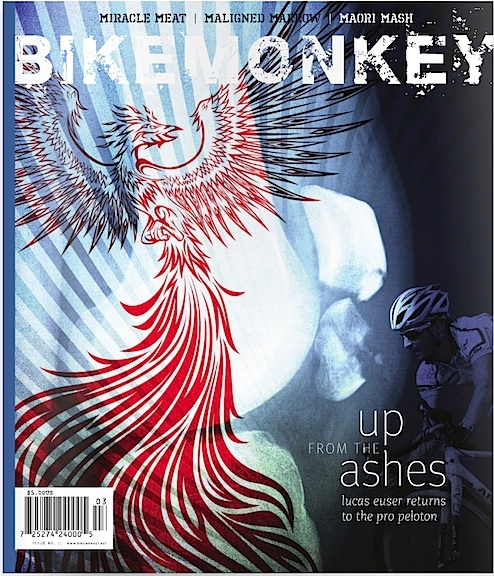 Then you’ll enjoy Bike Monkey, a magazine that’s about people, bikes, and rides. I dig it, and hopefully will someday be good enough to write for it. You’ll get a free issue of Bike Monkey with your swag box, as well as a great discount offer in case you decide to subscribe. Which you should. Leverage : True story. As I was killing time in the Chicago airport with a co-worker, he mentioned his favorite show is Leverage — an action-packed show about a group of thieves who run cons to help people who have nowhere to turn. I downloaded an episode, and it quickly became one of my favorite shows for while riding the rollers. Then — in a coincidence of awesome proportions — I found out that Paul Guyot, a Friend of Fatty and frequent commenter, is actually a writer/producer for Leverage. He hooked me up to the show, and now you’re going to get a coupon to download an episode for free. Huzzah! 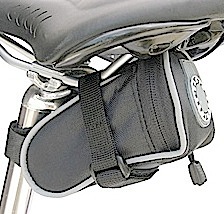 Banjo Brothers Seat Bag: You know who the first advertiser I ever had was? You know who the first company that ever did giveaways with me was? In both cases, it was Banjo Brothers, a small company making great bags for cyclists. I have their Seat Bags on every single bike I own — both road and mountain. This year, Banjo Brothers will be supplying a variety of different seat bags for the 100 Miles of Nowhere. Which will you get — the Mini, the Small, the Medium, or the Large? You won’t know ’til you get your box. And a free bike bag is even awesomer. DZ-Nuts: DZ Nuts returns for a third year as a sponsor of the 100 Miles of Nowhere. Awesome. If you use chamois cream, it’s high time you try DZ-Nuts. If you have never tried chamois cream, I cannot think of a more perfect time to begin. As I have noted in my review, this is good stuff. Seriously, if you’re going to be riding your bike for 100 miles and not going anywhere while doing it, you should at least be protecting your junk. CarboRocket “Half Evil” CR333 : A couple years ago, my friend Brad told me about a new sports drink he had in mind: something powerful enough that you could drink it — and consume nothing else — long term, for however big your ride is. 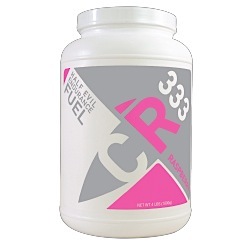 Soon, had had invented “CR333″ — because it has 333 calories per serving. In my defense, I didn’t honestly expect him to take me seriously. Taglines notwithstanding, CR333 is amazing. You seriously can go all day with it. No upset stomach, no bonk. And 100 Miles of Nowhere racers will be the first people in the world to get to try out the new single-serve packets, in both raspberry and lemonade. Winchester Bars: What’s the antidote to yet another energy gel or energy chew or whatever? Meat-ergy is, that’s what. Since getting a couple of boxes of these Winchester Beef and Cranberry bars, both the Runner and I have become huge fans. They’re like jerky, but with cranberry to give both taste and texture variety. I was kidding when I wrote my original “Meat-ergy” post, but I’m not kidding at all when I say that these are fantastic. And if you’re a vegetarian, you can give yours to someone who isn’t. They’ll be glad you did. (And I’ll leave you to consider the ethical considerations of a vegetarian giving meat to someone.). I plan to make an event of the 100 Miles of Nowhere. On June 4, starting around 5:00am, The Runner and I are going to ride the Suncrest hill as many times as necessary to do 100 miles. We plan to ride from the Alpine City Park to the top of the South Side of Suncrest, then down to the bottom of the North side of Suncrest. That’s 10 miles, with 1225 feet of climbing. Then, of course, we’ll retrace our steps. So one complete out-and-back is 20 miles, with 2500 feet of climbing. Which means, after 5 laps, we’ll have ridden 100 miles and climbed around 12,500 feet. That’s a whole lotta nowhere. We’ve asked some friends to join us, so there’ll be at least five other people doing this ride with us. And we’d love to have any local riders who want an intense day of riding — and climbing — nowhere to join us. Of course, if our route seems too mild, you could just do the North side of Suncrest, over and over. By my calculations, that should — in 15 laps — give you 100 miles and 18,375 feet of climbing. That would be a pretty amazing claim to fame. I’ll post more details soon. But if you’re local, mark your calendar: June 4 is the 100 Miles of Nowhere @ Suncrest. What Are You Going to Do for the 100 Miles of Nowhere? So, now you know when you need to register. You know how much it’ll cost. You know what’s going in the bag. Now you need to ask yourself, “What course am I going to ride?” You see, when I originally created the 100 Miles of Nowhere, I simply thought of it as 100 miles on my rollers. But readers took the idea and came up with much more creative and interesting ways to ride 100 miles. On a unicycle. Around a roundabout. On an aircraft carrier. So I’d like to have you post in the comments section your idea for what kind of course you’re planning for the 100 Miles of Nowhere. And are you going to be riding it yourself? Or with a large group? The beauty of the 100 miles to nowhere was doing it on rollers, the suffering of the hills, wind and weather replaced by the suffering of the garage wall for 6 hours. I will be doing it where the God of my understanding meant for it to be done, in my closed garage, it will probably be over 100 degrees in there in June in Texas. Just like the Hotter than Hell with out the wind or the scenic vistas. We have a health trail that runs around most of Lawrence. I’m looking to do a five-mile section of that, out and back 10 times. On a New Belgium Fat Tire Cruiser bike I won last year. Hope to be in this year. Not sure where. The most tempting option is the “track” behind my kids’s school (really lousy blacktop). But it’s somewhere between 200 and 300 yards, and I think it will take forever to ride 100 miles considering the short straightaways and the zillions of kids I’d have to dodge. Anyone in the DC area got a good suggestion, other than the dreaded 3 mile loop at Haines Point? We don’t own trainers so my husband and I will be completing the 100 at a park near Tampa, FL – Flatwoods. They’ve got a 7-8 mile paved loop we’ll be riding over and over and over and over… This will be my first 100 so I’ve already started training! Looking forward to an awesome day & reading everyone’s stories afterwards! I’m thinking either 100 miles on the abandoned Detroit velodrome, or 25 laps of the Quail Hollow mtb course east of Akron. Hoping to make it into the registration before too many sign up. No matter what, though, my husband and I will do the 100 miles. But probably on June 3 because the route we plan to use (the 1.1-mile Memorial Park Picnic Loop in Houston) is closed to car traffic on weekdays, but not weekends. Can’t wait, this’ll be my 3rd year :D. Since the date falls on this year’s Dirty Kanza 200 (200+ mile gravel race in the KS Flint Hills), I’ll probably try to hook up with some guys in Emporia again & ride with them. Maybe the week before DK as part of our tapering ;). I’l ask them if they want to do rollers in front of the bike shop again or maybe do one of the big climbs from the race 20 or so times. My mother was diagnosed with breast cancer for the second time yesterday, and the 100 miles of nowhere was announced today so I guess you can say I have plenty of motivation to do it this year. Your route sounds too intense for me, I am thinking it will be the Liberty Park loop. Fatty to point out you also have 12500 ft. of descending to do. Check your brakes. Excited! I’ve never ridden more than forty miles before, so this will be my first century. I plan on just riding around the block. And like any self respecting city kid I only own a fixie. So if my quads aren’t bursting out of my shorts by the end then I will be severely disappointed. Anybody in the Richmond VA area interested in lapping me? I’m in the DC area, too, and there are plenty of options on the MUTs. You could go around and around the loop formed by W&OD, Mount Vernon Trail and Custis in Arlington. I’m planning on going back and forth over a semi-flat stretch of the W&OD (I am NOT up to 12K feet of climbing like our host). Golden Gate Bridge on rollers, or trainers, looking west! (Lot’s of visibility there) That was the original idea, but you have upped the stakes, with your hill climbing. Mt Tam behind the house is looking like an option. A serious hill workout. Then again any Fatty’s who want to form a group at the bridge give a shout out! Paging Dr. Laura…. Land’s End in San Francisco has a nice ring for such a group effort. Hmmmm? In my house – I don’t have any friends who ride. With my dog as companion, and reason for any breaks I might take. Just have to remember to get books as I don’t watch TV when I pedal nowhere. I’m thinking of doing 80 loops (1.25 miles each) over and back on the 17th Street drawbridge in Fort Lauderdale. Sounds pretty lousy to me! At least I’ll get to rest when the boats go through…. Anyone in the Phx area that wants to meet up to do Usery Pass loops? If so, meet at the Walgreens at Power and Thomas at 5:00 am. wavering between an epic stupid and thuroughly dumb course on my real axiom trainer that is pure 3%-5% grade or 200 laps of my block, which has considerably less of a grade. But my block might estrange me even more from my neighbors then I already am. Hmm decisions decisions. @ Jenny – Did my 100MoN in Central Park last year. Words of advice: start REALLY early, make sure there isn’t a running race that day, and skip the harlem hill using one of the transverses. I rode the lowerloop (crossed from east to west @ 72nd street every time) and it saved me. I think it took 59 laps of the lower loop to hit 100mi. If you want a few buddies to ride with, let me know losdawg AT gmail DOT com. At least 2 others are doing it with me this year, but I’m not sure where yet. If you get bored of Suncrest and the road, come over and join me for part of my 100 miles of Lambert. Last November, a fellow middle-Tennessee randonneur and dear friend, Peter W. K. Lee, fell to cancer. One of the last things that I told Peter was that I planned to do a “200K of Nowhere” in his honor, piggy-backing onto Fatty’s wonderful ride. My plan is for mid-May, with a bunch of us doing this ride as a set of five 25-mile loops in the steep hills around College Grove, TN. I’ve even been accumulating some extra swag for my fellow riders. I’m pretty sure that I can get about 10 of the “hard-core” guys that rode ultra-distance with Peter, and hope to get another dozen or so “newbies.” Getting more people into ultra-cycling would really have made Peter happy. Raising money to fight cancer might have kept him alive. For the Suncrest ride will you be running a shuttle for any of us who would prefer to do a downhill 100 miles of nowhere? I plan on signing up for the Mohican 100 MTB race category since the race falls on the same day as the 100 miles of nowhere. It will be interesting to say the least. I just hope the race promoters let me where the 100 miles of nowhere # as well as their race #. Similar to Zach, the loop around my neighborhood is 1 mile, exactly. I wonder if my neighbors would call the cops if I did the loop 100 times? The last couple 100 MON fell on bad dates for me, but this year I will do it. My plan is use the short loop (~1 mile) at the veloway in Austin. It will be hot by June 4, so I’m planning an early start and an easy pace. Oh man I can’t wait! It was so…well, not fun really..last year, I can’t wait to do it again! So the big question is…do I do it on the trainer, or do I do 75 1.3 mile loops? No set course yet, but I know there are several fatties here in Las Vegas who are planning to do it this year. Have to get together to figure out the route to take. As the reigning north east corner of australia 100 MON champion last year i stepped outside and did a 120 laps of a local crit ciruit, starting pre-dawn and literally having to brake for kangaroos jumping across the circuit in front of me. Fine idea. I could really make myself cry and do the CCT about 6.5 times, dodging walkers and joggers endlessly. I am inspired by all of you who are riding through your ‘hoods. I kind of like the idea of going around the (hilly) block a lot (200x would be necessary, I think), but with my luck I would get a ticket for blowing a stop sign — and there is one on each corner! Then again, the ability to use my house for “aid” stops is tempting . . .
There’s also Rock Creek Park, which is closed to motorized traffic on weekends. Little bit wider than the CCT, but just as packed, I guess. Cant wait to register and do some fundraising for LiveStrong! I’m joining your LiveStrong team again this year! Anyone from Denver want to ride to Mt Evans and back for the 100 miles. Its 50 uphill, but a fast 50 down. 100 Miles of Nowhere. A chance to ride my Sunday recovery loop 10 times! Awesome opportunity to get my ride on for a good cause. I am very interested. Will be my first century. Debating on the monotony of riding around the neighborhood or having a little scenery and doing 11 laps around White Rock Lake. Anyone in Dallas have any better ideas? You wrote that the “profits” of this are being donated- can you give us the break down on how much of the cost is going to actually be donated to Livestrong? Which of the companies involved are charging for the swag and which ones are donating the swag? Thanks for clarifying, I can’t wait! Denver to Mt Evans?? Sounds like a ride to “somewhere” and back. Is it open to the top by early June? I’m thinking about laps around the circle in our neighborhood north of Golden (I need to check the mileage and elevation profile). Keep the Denver folks posted on any group plans for 100 miles to nowhere, we my join. Rock Creek is where I usually ride. Since you can use the road, the CCT walker issue isn’t a problem. My usual course, mostly on the closed road, is 22-25 miles. Not short enough to be in the spirit, I think. But we could a shorter loop 20 or so times. I am definitely up for a DC-area group, although I warn you all that I am quite slow. So that means I can win the DC-area “Damn He’s Slow” division! I am excited for this! I am trying to get a couple guys to do this with me and find a fun loop to do all day long. If that falls through then it’s me on the trainer with my beagles staring at my like I have lost my mind as I complete my first 100 mile ride. Suncrest 10 times! That is insane–I’m in until I complete all ten laps or the DZ Nuts wears off. I’ll try and recruit some other riders in the area as well. Whooo hoooo, must start planning! How about a different take on a triathlon? 10K run (treadmill), 100 miles on the bike (probably rollers) and 100,000 pounds lifted in my gym. In honor of my mother who is on the down side of lung cancer. I’ve done all 3 seperately but not together…yet. We shall see. Merle, I am excited to know there is another fatty in Richmond. Last year I did the 100mon on the loop on Belle island on the same day as the Susan Komen walk. Only did about 30 miles tho as I am a real fatty and very timid on a bike. This year the registration is during my vacation to Holland and Belgium [seeing the tour de Flanders] I would consider riding even if I don’t register. I don’t own rollers, so I’ll go with the 2.5 mi loop around my neighborhood. I’m going to have to start training by riding around those blocks because just thought of 40 laps makes me a little crazy! I am considering 160km of a 0.9km loop around the block near home thats a 178 loops. It will be winter here in the great southern land of OZ by then and should be cool around 10-14c. YES! I didn’t miss registration – just followed last year’s link! Roswell, GA 100 Miles to Nowhere around the 2.85 mile loop (including stopping all 4 stop signs) at sunup on May 22. As the reigning Champion of the “Woodlawn Heights Criterium – Fools Training for IronMan Japan” division, I’ll be doing the block around my house again….186 times. But this year I’ll be competing in the “Woodlawn Heights Criterium – Fools Recovering for IronMan Lanzarote” division. Any reason to ride my bike for a good cause. As my neighbour (and good friend) was diagnosed with Hodgkin 2 days ago, we don’t lack a motive for riding on June 4. We are planning to make an All Flanders Orval Loop, featuring one steep hill, one stretch of cobbles, one part of bad road surface and at least one part of unfavorable wind. And all this in less than 3 miles. And after 33+ loops we will celebrate life and hope with drinking some exellent Orval Trapist beer. Anyone interested in riding a two mile loop in the Detroit area? Unfortunately it is very flat, but I can assure you it is very boring – so there is some suffering! We can battle for the balding man with a belly 35-40 division. Winner receives a six pack! (Of beer). This will be the first time I participate in the 100 Miles of Nowhere. I learned of Fat Cyclist shortly before last year’s event. I live on an the Island of Alameda in CA. I’d like to ride around the Island. I’m gonna’ try to get some more people involved. It is approximately 6 miles long and 1.5 miles wide. Is that doable? I have a new spinning bike that I have to set up, but I don’t know if the apparatus I ordered tracks miles or revolutions. That could be a problem. If I can’t get anyone else riding this year, I will work on it for next year. I hope to have a jersey so people will know who I’m riding for next year. I lost a friend with cancer two months ago and another two years ago in May. I’ve lost other friends and family, but the years escape me. A friend of mine just learned her brother has lung cancer and she lost a brother who was an avid cyclist to cancer two or three years ago, too. Thanks Fatty for all you’re doing to eradicate and help others affected by cancer. Debating either the trainer in the basement in front of a tv, or the Tour De Cul de Sac, running from our cul de sac to another about 1/4 mile away. I wonder how long I will ride it before the neighbors call for “help”…? hey fatty, i’m so glad to see you’re doing a 20 mile loop, I was worried my regular 9 mile training loop would be too long for this! It’s a flattish course with one climb (that i call the Poggio, because I once finished a long ride on it) it has tail winds for one side and head winds on the other, so it’s equally joyful and frustrating. My summer goal ride (a 112 mile sportive) is a couple of weeks before, so that has now become a mere training ride for this years big event! The previous two years we rode our tandem on the trainer – once outside in a park (where people steered far clear of us) and once inside in the garage (where we watched a movie triathlon of bike-run-swim in honor of Iron Fatty and Runner). We’ll sadly have to give up our lead position in “tandem on trainer” division this year. In 2011, June 4th falls on the weekend of the Ohio 600k brevet. We hope to have already completed a 600k for Paris-Brest-Paris but if not, this is it to finish qualifying. We won’t technically be riding nowhere, but chances are we’ll end up finishing where we started. We’ll be wearing our Team Fatty jerseys and having a wonderful time (including the bonus miles). Let’s raise some money for LiveStrong. Hains Point is the obvious (but boring) choice. The Trails loop around Arlington is almost too interesting. If we could stay in my neighborhood I recommend circling Lincoln Park, it’s exactly half a mile around so there’s 200 laps. Anyone? Anyone? Bueller? Tell them I want my share of the profits, which I will donate. Oh heck, let them donate my share–less bookkeeping for me ! I was one of those people who procrastinated last year and didn’t get in. I fully expect to wake up at midnight on the 11th just to register and fall asleep a week later just because of the pure excitement alone. I’ve yet to pick out an insultingly short course, but an idea is coming to mind. Can’t wait. Haven’t been on a bike in years…but I live on a .7 mile loop, so seriously thinking about this. I also putoff signing up last year and didn’t get to partake. This year I plan on joining in and riding on a small section of trail on near my house. This will be the furtherest I’ve ridden on my mountain bike. The good news, there’s not much elevation around Milwaukee, WI. Round the church and green, past the library. Round the church and green, past the library. Round the church and green, past the library. Round the church and green, past the library. Round the church and …A perfect New England ride. Uphill half the time. The loop is 0.22 miles. Can’t wait for this year’s 100MON. Mine will not have any climbing of note. Thinking laps on a trail in Independence, MO (Little Blue Trace). I’m debating between doing it inside on a trainer – because that’s the purist’s way to do the 100MON – or making myself suffer and riding four laps of a 25-mile section of last year’s stage of the Tour Of California, which would include the infamous Rock Store climb, 4 times. Yeah, maybe I’m a purist. Hmmmm… The traditionalist in me says go for the rollers, the slightly less insane person in me says to do the 3.25 mile loop around Green Lake in Seattle. Does my bike commute earlier in the day count towards my mileage? No, I guess not. Paul with your insider connections you should be fielding a team to ride the backlots at the studio(s). Imagine seeing the same NYC street scene so many times. Or…100MON through a dusty western town. Time to step up cowboy! I like the visual of Lycra and Spurs. My wife and I are planning on participating for the first time. Going to ride a .75 mile loop in our neighborhood. I have way too many bikes including a vintae Schwinn tandem and just to make it interesting I plan on riding at least a few laps on each of my bikes. We are hoping to get some other folks to do it with us. When it is over and assuming we can still move, we plan to have beer, barbeque and a bonfire. Last year I did 400 laps of a local decrepit quarter-mile running track, on a singlespeed cyclocross bike geared for climbing (39×19 in case you’re wondering). Now that I’ve recovered from the gnarly achilles tendonitis brought on from 5+ hours of constant spinning at 110 rpm, I plan to ride 110 laps of the top loop at Seward Park. It’s about 0.9 mile per lap according to my cyclometer. I hope you other Seattle Fatties (“Lesley Jacobs” and husband; “Karena;” and others) will join me! Note to Karena — Green Lake gets so crowded that it could be hard to knock out 100 miles unless you start at sunrise. Not much fun to dodge Ipod-wearing power walkers, joggers, dogwalkers, chatty stroller pushers, kids and rollerbladers for multiple hours. I’m a little late to the D.C. discussion, but I would propose following with the tradition started by Anne P. last year, and doing Hains Point. I know, it’s borrowing, and awful, but isn’t that the point? Besides, the wide roads and availability of facilities may make it more conducive to riding with a (hopefully) large group. Whatever is decided, let’s get a good group together for this year. If anyone else in the mid-Valley, Oregon (Eugene-Albany-Corvallis, maybe Salem) – wants to get together for a 100 MON, I’m game. May take on the 88 trips over the rail road tracks again this year or just set up the bike on the trainer in front of my office that sits next to the local Post Office. That should raise a few questionable eyebrows! You’re a cool dude, Fatty. Fatty – I am a solo entrant from the awesome town of West Falls, NY. I have a nice 3 mile loop with .3 entrance and exit from my house. I might ride 11 one direction, switch go another 11, and then wrap up with my original direction. When I was marathon training I did this loop 5 times and I had a couple of people ask me how long I was going to go – somehow I believe this will trump it. There is some climbing involved but it is pretty equally divided both directions of 1/2 up and 1/2 down so it should not be horrible. I plan on entering this year after being closed out and my Race Category is 45 y/o Male Veterans at The West Falls Crit June 4th, 2011. I hope no one else enters – I would like to win something sometime! After reading about this for awhile, I think that this year I will jump in and do it. I haven’t done a century yet and have Levi’s Gran Fondo coming up in October – so I gotta train. One lap of my condo complex is .29 miles, so 344.8 laps (ain’t no way I’m doing that last .2!) gets me the full hundy. I plan on inviting a few friends over and turning on the BBQ, open up a keg and play a bunch of cycling movies on the 36″ in the garage. Should be a stupid fun time. Do you know if they have stopped the periodic ticketing of riders at tthe one stop sign at Haines Point? Actually, having to stop every three miles to avoid a ticket might actually be just the ticket for going nowhere! I’ll be registering bright and early on the 11th. Have to ride early though, doing another century the weekend after, Trek 100 in Wisconsin at the Trek headquarters. Benefits Midwest Athletes Against Childhood Cancer (MACC Fund). Only made 100k last year due to crummy weather, looking forward to putting in the full century this year. Great Job Fatty! Any Canucks in the Toronto area doing this this year? Last two years I did it in the Persian Gulf. Nothing like a pan-flat desert ride in the middle of the night. So, this year I need a new course and I want it to be cool. No ideas yet, so I’d love to have some partners in this insanity. BBQ and beers at my place afterwards for all. 100MoN, like in my dreams, last year…I still owe 160 laps around a 400 meter velodrome, that’s something like 40 miles. I was sick (not from the 100MoN) but feeling low. Also to borrow a now famous quote, I didn’t realize the “sheer vehemence of the suckage” and have had nightmares since. While my dog has dreams of chasing after the squirrel, I dream of chasing a damn rabbit around that track. And my guilt is another layer of suckage. Any Canberra, Australia 100MON’ers? I’m thinking Stromlo crit track – pre-dwan start! They’ve been out fairly frequently the last couple weeks, but usually it’s hit-or-miss on whether or not they show up. Last Thursday they were out during the Thursday evening “lap ride”. As long as the group made a concerted effort to slow down, be cautious, and not blow through it at 20 mph, they were letting guys go. Plus, I doubt they’d be out there all day. This will be my first year doing this and I can’t wait. Unfortunately, I am racing the weekend of the 4th already. However, I have a found 3-4 other bloggers who are racing the same weekend so we are hoping to coordinate a day before the 4th to do our rides together. I’m down here in Christchurch New Zealand, so am going to give it ago. Since that is the start of our winter here, I am hoping the weather is not too bad. Have a few possibilities of routes to do. Really looking forward to it. Will you have any kind of video chat? If we’re all in our living rooms or garage or whatever, we could also be on OoVoo or something like that. Although, I may ride the 3 mi loop that they use near my house for the local Tour De Cure family ride. This was one of my goals when I started my quest to lose enough weight to be able to ride a bicycle some 3 years ago. 275 lost pounds later I think I’m ready to try the 100 MON. I’m hoping to find others in the Mid Hudson Valley area to join me on a MON ride. If I am on my own, I’ll do the .1 mile loop in my neighborhood in New Windsor, NY. It would be fun to find some other like minded folk so that we could find a slightly less boring venue. davidh- repeating Mt Tam climbs could be a good warm up for the August Mt. Tam century! I think I’m probably in. Hmm. June 4th will be the final day of a three-day, 85-miles/2000 meters climbing per day ride through the Bastogne region of Belgium, commemorating D-Day and General Patton’s route thereafter. I wonder if I have the strength/stupidity to put in an extra 15 miles and make it 100 for that last day. And I wonder if I can get any of the other 299 people to do it with me? Hmmmm…Detroit – The Wheeling City. I like it. Fatty, I don’t think that downhill should count toward your miles. I mean you’re not pedaling, you’re just sitting there doing nothing while gravity takes you down hill. you may as well be in a lazy boy drinking a beer and watching the game for those ‘miles’. i think you need to do the climb 10 times. that would be a real 100 miles of nowhere. Hello Kevin G from Ft Lauderdale, FL. Forget that bridge and come out and join my group of 6 or more at Markham Park in Sunrise. There is a 6 mile loop and a 1 1/2 loop if you really want to be monotonous! We’ll have an easy-up set up for rest/eating to protect you from the sun. Would love to meet some other Fatty followers! I aim to reclaim my podium spot in the Richmond (CA) Shipyard Division. I’ve been thinking that I really should cut last year’s 3.2 mile loop down to a more mind numbing mile loop. I would really like to ride this with somebody. Email me at mayhuemf at yahoo dot com and we’ll work somethin out. Hopefully this is open to international entrants? Or do you have be from and in the US? I’d love to do the 100miles of Nowhere (“100moN”). Course would take in the road works just outside of my avenue (the workmen there are going to get really pissed off seeing me shuttling backwards and forwards), 2 mini roundabouts and short 1:15 hill which, by the end of the route will probably feel like a 1:5. Long time reader and 100MON considerer. I think this is my year. Anybody in the Bay Area have a good idea for a scenic loop? I particularly like DavidH’s idea for “riding” the GGB on rollers…or just riding all 100 miles back and forth across the GGB. Could also be up for a Mt. Tam loop. zion national park – visitor center to the temple of sinawava. i think we have to do it 6 times. no cars only shuttle busses. imagine all the shuttle bus drivers we will annoy because they are not allowed to pass a moving cyclist and i’m not going to want to pull over. we hope to get a big group but i’m guessing many will be race bandits. The local University has a ring road that’s 1.6 miles long (or, since it’s in Canada, 2.6km). About 60 laps of that will make up my 100MON route. I’m going to sign up this year (at least I hope I get in!). Didn’t do it last year because of money. I’m going to splurge this year though. I can’t wait. Fortunately, it doesn’t conflict with anything (our local Run for Women – http://www.akrfw.org – is the following weekend so I”m good). Very excited about this since I regretted not doing it last year even though I didn’t have the funds. I’m going to have to set a bunch of reminders. I am in Alaska so I’m behind everyone (except Hawaii) in terms of getting on the website. If registration starts at Midnight on the 11th (that’s the first hour of the morning right? ), I should be set. Now to set all the reminders in Outlook, put post-its on stuff, and write myself notes to sign up. Woot! Trying to find other crazy people to join me in Anchorage, AK if there are any other Fatty followers here…might have to take NYCCarlos idea and start a Facebook page…Also, I ride for my brother-in-law Chris who is battling colon cancer and is only in his mid- to late 20’s. Freakng ridiculous. F Cancer!!!! I’m hoping to do the 100 Miles of Nowhere this year. The plan is either to set up some trainers or rollers in my basement *or* to ride the Rundill Road loop in Iroquois Park, here in Louisville, Kentucky 33 times (a total of 108 miles — maybe I’ll only do 31 times, for 102 miles, but somehow 33 seems better). Right now, I’m leaning towards the Rundill Road option. I think I’m doing the Noodle route this year. Enjoy the shear suckage one year and bow out gracefully to let others have the suckage the next year. I really wanted that T-shirt though. I’ve got 3 or 4 friends coming over on June 11, work is not allowing the June 4th date to work out. We’ll be riding 53 laps around my 1.9 mile block, and climbing a total of 9941′. This should be fun! Anyone in Cleveland, OH want to team up to ride nowhere together?